Writer Elliott Kalan discusses his collaboration with artist Todd Nauck! 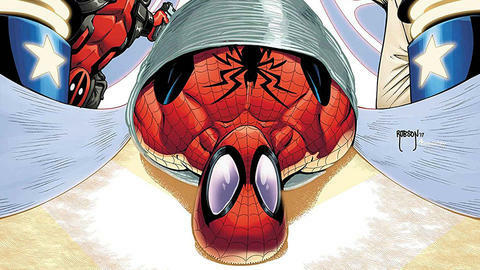 On October 4, SPIDER-MAN/DEADPOOL #22 features an awe-inspiring twosome that cannot be missed. No, not the ones in the masks—writer Elliott Kalan and artist Todd Nauck! Kalan and Nauck have sent Spidey and the Merc to face off against the mad game designer Arcade in a custom deathtrap known as Murderworld. At a time when Spider-Man and Deadpool’s partnership stands on shaky ground, this smart-talkin’ team-up will be tested like never before. We caught up with Elliott to hear more about what lies ahead for the super duo. Marvel.com: What made you decide to use Arcade as the newest enemy for the Wallcrawler and the Merc with a Mouth? Elliott Kalan: You can never really predict or completely figure Arcade out. He’s a mostly amoral madman, but at the same time he’s very attuned to other people’s psychologies and weaknesses—and apparently has the massive financial resources to build, like, an entire personalized theme park of death. So, for Spidey and Deady, the excitement came from figuring out how Arcade sets up his park to prey on their particular weaknesses and insecurities. And then finding out how Spider-Man and Deadpool resist and overcome that. Also, Arcade loves a good joke—just like our two stars. His sense of humor can just be a little off. A little homicidal. Marvel.com: What made Madripoor the right setting for this tale? Elliott Kalan: Madripoor is one of those places on the Marvel map that gives you a chance to escape the standard world of New York, for example, and get away with things you normally wouldn’t be able to. Madripoor feels like a strange place for Spider-Man to find himself in; it’s so fundamentally criminal a place—as least as it’s been written. Yet what better place for Arcade to set up shop than a nation that’s never had the highest respect for the law? Marvel.com: How did you come up with Arcade’s death traps? And how did collaborating with Todd Nauck bring that to life? Todd was instrumental in making everything happen. There are a few moments where I wasn’t even sure how things would work out visually, then Todd said, “Oh, you mean like this?” And it felt like he reached into my brain and put it on paper—only a thousand times better. There’s a moment in issue #22 involving Deadpool, a fighter plane, and a dinosaur where Todd just went ahead and made my dreams come true. Marvel.com: How was the overall collaborative experience with Todd? Were there elements in the script you knew you’d be able to pull off with him as your artist? Elliott Kalan: Todd’s amazing. I’ve been a fan of his for a long time—and having recently learned he’s also a fellow fan of Mystery Science Theater 3000, I knew we’d get along. I fully trusted him to be able to take everything I handed him and tell the story as clearly, dynamically, and gorgeously as possible. He really made a bunch of my half-baked concepts shine. Todd gave me the freedom to get as big and crazy as I wanted, but also to not to be afraid of adding as much dialogue as I needed. I really I hope I get the chance to work with him again in the future. Marvel.com: In your mind, what are the essential traits that truly bring Spidey and Deadpool to life on the page? And by personally revisiting Spider-Man with this story, did you alter your approach to him since writing SPIDER-MAN & THE X-MEN? Elliott Kalan: My take feels essentially the same because I’ve been living with Spider-Man as a moral and ethical guidepost since I picked up WEB OF SPIDER-MAN #90 (with the hologram cover) at age 10 and began my tutorship in his philosophy. To me, the essence of Spider-Man is having a strong moral and ethical code but struggling with them emotionally. He’s constantly in the process of striving to be the best—but he often fails because to choose one moral value means inadvertently turning your back on another. He is truly the greatest of all Marvel heroes because he’s humanly weak and his choices are difficult to make, but he makes them anyway. And I see the essence of Deadpool as someone who decides to become Spider-Man after a lifetime of being the exact opposite of that. He strives to do better, but gets weighed down by years of sin and, frankly, a knowledge of how much easier life can be when you don’t follow the rules. It’s harder to navigate morality for him, and when he sees someone like Spider-Man he sees an impossible ideal—but he still finds the strength to attempt to get closer to that ideal. Both Spider-Man and Deadpool are emotional and moral strivers constantly coming to terms with their failure to be perfect and refusing to let that failure stop them from trying. But don’t let all this heavy talk fool you, this story is basically about Arcade throwing killer robots at them. Marvel.com: How might you pitch this storyline to readers who aren’t sure if they should pick these issues up? Elliott Kalan: Face front, True Believers, this titanic two-parter is chock full of Mighty Marvel Milestones! Your Friendly Neighborhood Spider-Man and everyone’s favorite Merc with a Mouth are pushed to the limits by the amusing atrocity of Arcade! Arcade as you’ve never seen him before—a glimpse of his private life, and with multiple different haircuts! A robo-wolverine! Tigers! Dinosaurs! Tidal waves! Thinly veiled satire! Plus, the first appearance of the Sensational New Marvel Discovery who’s sure to be everyone’s favorite Character Creation of 2017: the blade-wielding apex assassin who could only be called The Stinger! Don’t miss it, folks, this one has it all! SPIDER-MAN/DEADPOOL #22, by Elliott Kalan and artist Todd Nauck, hits on October 4!